Ibn Khallikan's Biographical Dictionary, or Deaths of Eminent Men and History of the Sons of the Epoch, was the noted Arabic scholar Ibn Khallikan's most well-known and respected work. The author worked on the tome from 1256 to 1274, compiling names, genealogies, and histories of prominent or conspicuous men in the Islamic world. The final work was translated into English by William MacGuckin de Slane and is longer than 2,700 pages. It has been quoted by many Arabic rhetoricians and grammarians in other works, as it is considered one of the most important records of Arabic history ever written. Here, separated into four volumes, the Biographical Dictionary is an essential work for any student of Muslim culture and literature. Volume II includes: An Introduction by Mac Guckin de Slane; a detailed index of all biographies; notes from the translator for each biography; and detailed genealogies of hundreds of Muslim figures, including Ibn Babak the Poet, As-Sulaihi, Malik Ibn Dinar, and Ar-Rabai the Grammarian. IBN KHALLIKAN (1211-1282) was a thirteenth century Arabic scholar who studied in Damascus, Mosul and Aleppo, specializing in the fields of language, theology, and law, including jurisprudence. He became a well-respected judge in Cairo, eventually becoming a chief judge in Damascus in 1261. 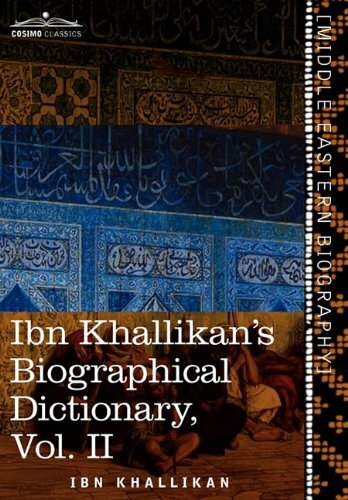 Khallikan wrote several books, but his most well known was Deaths of Eminent Men and History of the Sons of the Epoch, often referred to as the "Biographical Dictionary," which took him almost 20 years to complete. Khallikan retired from his position as judge just before his death in 1282. He was one of the most well-known historians and theologians in Egypt.